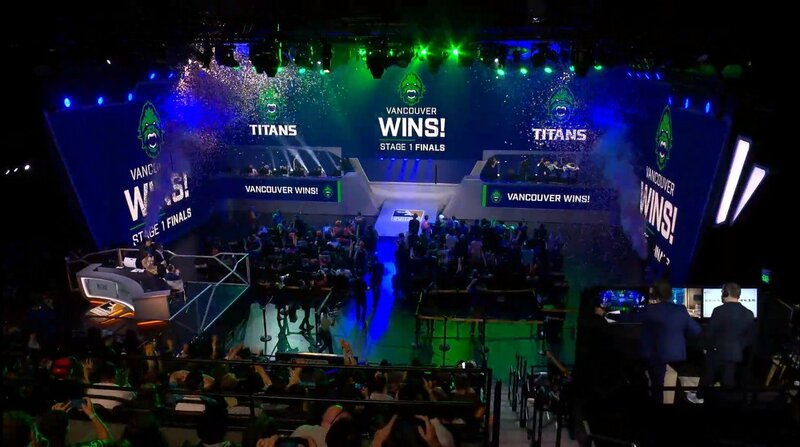 After a hard-fought seven-game series, the Vancouver Titans have finished Stage 1 fully undefeated and win the Overwatch League Season 2, Stage 1 Finals. The second season of the Overwatch League has flown by fast. Sunday saw the Stage 1 playoffs come to a head following an intense weekend of action. Only two teams remained following this week's eight-team tournament, one of them being quite unexpected. The #6 seed San Francisco Shock stunned the field by making it into the Finals, with only the top seeded, undefeated Vancouver Titans left in their path. But the Titans were undefeated for a reason and they showed why, defeating the Shock in an epic seven-game series to win the Stage 1 Finals. The seventh and final game took both teams to Rialto. The Shock asserted themselves early, emphatically capturing the first point. The Titans looked to regroup around the second point, but Matthew "Super" DeLisi completely wiped out their defenses almost single-handedly. The Titans regrouped and forced a Self-Destruct from Hyobin "Choihyobin" Choi's D.Va, which didn't hit, but the Shock didn't let that affect them, as they quickly took down Sangbeom "Bumper" Park. The rest of the Titans fell from there, as the Shock completed the final capture. The Titans got off to their own fast start behind fiery offense from MinSoo "SeoMinSoo" Seo's Zarya, who cleared the Shock off of the first capture point. The Titans kept their offensive flurry going into point two, with SeoMinSoo and Juseok "Twilight" Lee eliminating defenders left and right. That was quickly followed by another total team wipe, as the Titans proved why they went undefeated in Stage 1, completing the final capture in almost record time. With a tiebreaker forced, the Shock had only a single minute to capture the first point. But the Titans had gotten into a full groove by this point. Vancouver was able to hold the Shock to nothing and easily captured their point to complete the Stage 1 Finals victory. The Finals opened up with both teams on equal footing in Nepal, leading to an early tiebreaker. Bumper kept his team in it with a fierce healing game, but the Shock rallied behind Choihyobin's D.Va, Jay "Sinatraa" Won's Zarya, and strong tank play from Super. The Titans re-took the capture point behind a well-placed D.Va Self-Destruct from HyunWoo "JJANU" Choi. But Choihyobin took out Bumper and the dominos all fell from there, with the Shock able to capture the point and take the first game. Game 2 went to Numbani, where the Titans completely stifled the Shock offense. 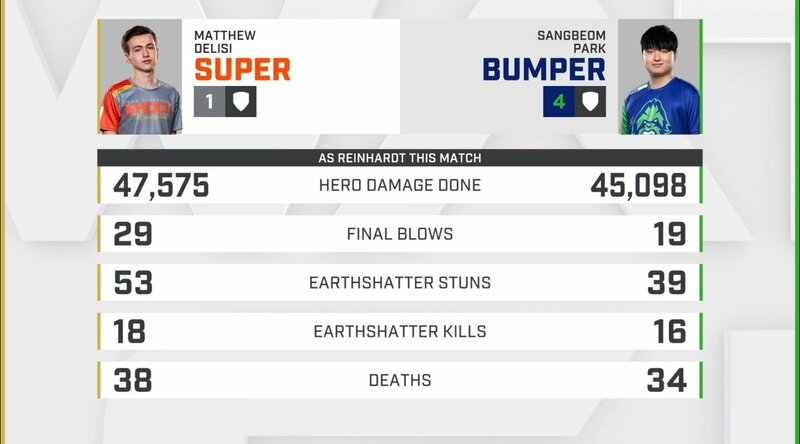 Bumper's Reinhardt led the defensive effort, as they systematically shut down all of the Shock's capture efforts. A late Earthshock Ultimate, in particular, spelled doom for the Shock. The Shock defense gave it a shot, but there was no holding back the well-oiled Vancouver machine, who capped the payload to end the second game early. Game 3 on Anubis went back and forth. The Shock was able to get its offense together, with Super's Reinhardt helping pave the path forward. The Titans set up a full defense along point B, with JJANU switching between D.Va and Wrecking Ball. The Titans were able to force Overtime, but Choihyobin wiped out half the team with a D.Va Self-Destruct. Sinatraa cleaned up the rest of the mess and the Shock went up 2-1. Game 4 went to Dorado, where the Shock tried to set a tone early with a strong offensive push. But they couldn't quite capture the second point, despite Choihyobin trying to catch the Titans off-guard with a sudden Wrecking Ball rush. The Titans shot back with the two payload points they needed, with Hyojong "Haksal" Kim able to sneak in and get the last cap the team needed to tie the series up at two games a piece. Game 5 headed off to Ilios, where the Titans were undefeated heading into Sunday. Sinatraa used Zarya's Graviton Surge Ultimate, but the Titans responded with a slew of their own Ultimate abilities to clear off the Shock. However, that depleted their resources to the point that they couldn't withstand the next Shock rush, as San Francisco took the first point. The Shock looked to maintain their momentum, but SeoMinSoo's Zarya and Bumper's Reinhardt provided ample resistance. They managed to help clear the Shock off at 99 percent and that's when the Titans locked them down, with Twilight and Hyojong "Haksal" Kim helping ward off San Francisco with back-to-back Ultimates. It came down to another tiebreaker and the Titans went unorthodox with their lineup, with Seominsoo switching to McCree and Bumper switching to Orisa. Seominsoo's Deadeye got zero eliminations, but the rest of the team rallied behind Haksal's Brigitte to clear off the Shock. The second Deadeye found its mark, eliminating Choihyobin, but with the Shock threatening to rally, Seominsoo went back to Zarya and Bumper went to Winston. The Shock rallied nonetheless behind Sinatraa and Choihyobin and stunned the Titans to go up 3-2. Game 6 went to King's Row, where the Shock got to work early. They quickly capped the first point, but ran into a wall of resistance, as the Titans quickly wiped the full team. The Shock was able to wipe out Bumper, which gave them an opening. While the Titans were still able to withstand their initial push, the Shock kept taking out an overly-aggressive Bumper and keep their payload moving. Sinatraa was able to keep Bumper on the sidelines with Zarya's Graviton Surge, but the Shock couldn't get through the rest of Vancouver's defense. The Shock unleashed a string of Ultimates to try and get the last point, but they weren't able to find their mark and the Titans held them to two points. To seal a victory, the Shock needed to clamp down on defense. Sinatraa warded the Titans off with Graviton Surge, combined with Minki "Viol2t" Park using Zenyatta's Transcendence. But the defense wouldn't hold up, as the Titans taking advantage of Haksal's proficient Brigitte play to capture the payload. The Titans rode that momentum to an easy second point capture. Vancouver wanted to complete the run, but Choihyobin crushed them with a D.Va Self-Destruct. The Titans bounced right back and managed to push the Shock off the payload long enough to get it to its final point to tie the series up at three games a piece. Though eight teams entered the Stage 1 playoffs, it was largely expected that the Finals would come down to the league's two undefeated teams. And while the Titans made it to the Finals without dropping a single game, the New York Excelsior fell on Thursday to the Seoul Dynasty in a stunning upset. The Titans had no such trouble with the Dynasty, taking them out 4-0 to reach the Finals. Meanwhile, the Shock also made it to the Finals unblemished, polishing off the Toronto Defiant 3-0 and the Philadelphia Fusion 4-0. The Overwatch League now takes a one-week break before kicking off Stage 2. Stage 2 of the Overwatch League's second season is set to begin on Thursday, April 4.